This family friendly concert is FREE of charge; 4:30pm-7:00pm . Enjoy a cool beverages from Lost Coast Brewery, The Booth Brewing Co. US, Humboldt Honey Wine or Humboldt Cider Company and delidious food from Southside Mike's BBQ. Dance & kick off the weekend with friends and family. We'd love to see you there! 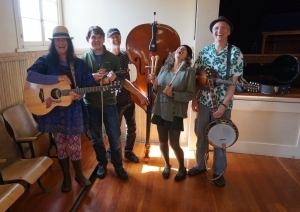 Featured band for August is The Vanishing Pints (Irish Folk Music).